From the Equator to the Polar Regions, from Indonesia to Mexico, the world's oceans are contaminated by plastic debris harming millions of sea birds and marine animals. 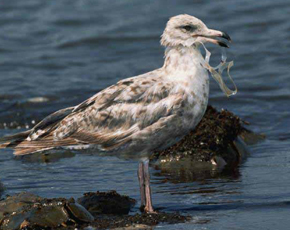 At least 267 different species are known to have suffered from entanglement or ingestion of marine debris including seabirds, turtles, seals, sea lions, whales and fish. Over 46,000 pieces of plastic litter are floating on average for every square mile of ocean today, killing countless sea birds and marine animals every year. Hi-Cone, the leading manufacturer of six pack rings, has joined us in helping raise awareness. They have taken positive action to respond to concern about animal entanglement. All recyclable six-pack rings have been made of photodegradable LDPE (#4) plastic since 1989. This means that is if ring carriers are carelessly discarded, they will photodegrade or break apart when exposed to UV rays. Shortly after Hi-Cone carriers are exposed to the sun's UV rays, they begin to lose "structural integrity," and "elongation" decreases as they degrade. The carrier loses approximately 75% of its structural integrity in a matter of days. Continued exposure will cause maximum embrittlement in a matter of weeks. At this point, it will break apart when disturbed by wind, rain or other forces occurring naturally in the environment, posing minimal danger to wildlife. In the near future, we will be adding recycling partners to incorporate materials from the top three sources of animal entrapment in our designs: Fishing Line, Fishing Nets and Plastic Bags. These measures have not been successful in eradicating the problem of debris and its effect on wildlife. We need to go beyond environmental awareness. We need to inspire people to create solutions, such as a biodegradable plastic, or one that could rapidly break down without harming the natural environment. For example of the 6-pack carrier, whose company put an end to the environmental myth of ”dangerous 6-pack rings” by creating a safer packager with photodegradable plastic. We need to keep on working to prevent litter from getting to our shores and finding other uses for what would be debris. The Origomu project reflects an awareness of the environmental effects of pollution and waste and employs the arts to inspire people to recycle and reuse environmentally harmful waste in creative ways.